BESTETTI – Model SPIDER – Oxford – French box calf Grey – Last « Perfetta ». I do not know if Riccardo wanted to pay a tribute to Stan Lee or Pininfarina with this model. Perhaps the two in fact! The upper may recall a spider web, with the facings and running onto the quarters. The Medallion & arabesques emphasize the plunging shape of the “Perfetta” last. Add to this the depth of an exceptional french calfskin, antiqued entirely by hand. 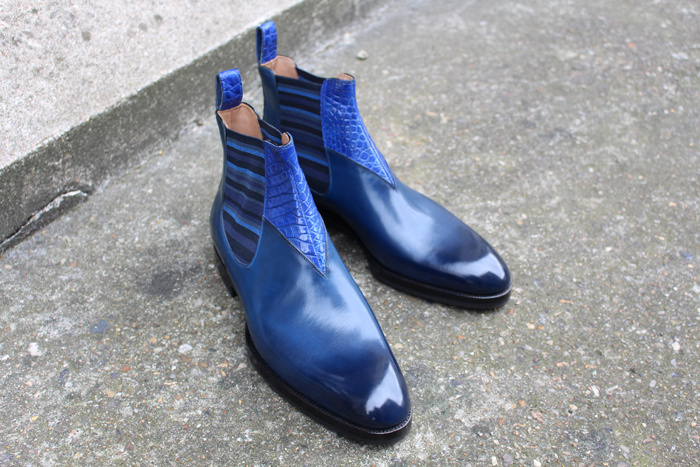 Color again on these blue Chelsea boots. The technical performance hides in the V-shaped piece sewn on the top of the vamp (see photo). It is connected on one side by a flat seam and on the other by a reverse seam turned backwards ! 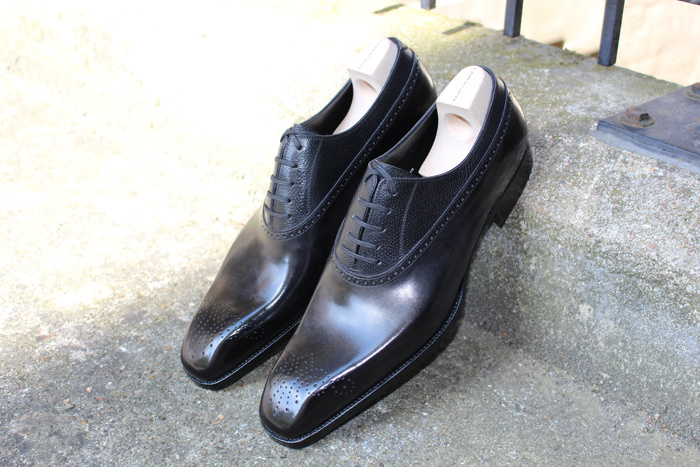 Our customer wanted black Oxfords, but with a little something to differentiate from the classics/basics. We have decided to combine two types of black calf: a fine grain on the top and a box on the bottom of the upper. Again, we couldn’t resist to have it made on the “Screwdriver” last. This MTO is a distinctive and refined dress shoe, which will bring you straight from the office to the Opera Garner Paris. This model is a mix of genres: the marriage of an “easy shoes” and a “Oxford ”. I have to confess a weakness for aniline box calves. These full-grain calfskin leathers come from the best tanneries and only the finest hides are used. Not only their touch is richer and their sheen deeper, but they are also more flexible and age better. The side gussets bring confort and a good close fit. 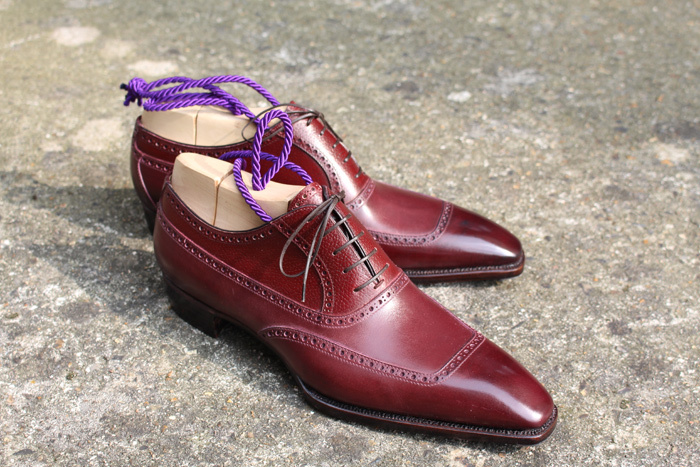 A classic Adelaide oxford shoe with a straight toe cap made in the “CRU Mahogany” box calf. The 645 on the “ Classic ” last is a basic shoe in your wadrobe, classic and versatile. After the low version (108) , this is the turn of the model 671 (boot version) to showcase this exceptional model from Saint Crispin’s. 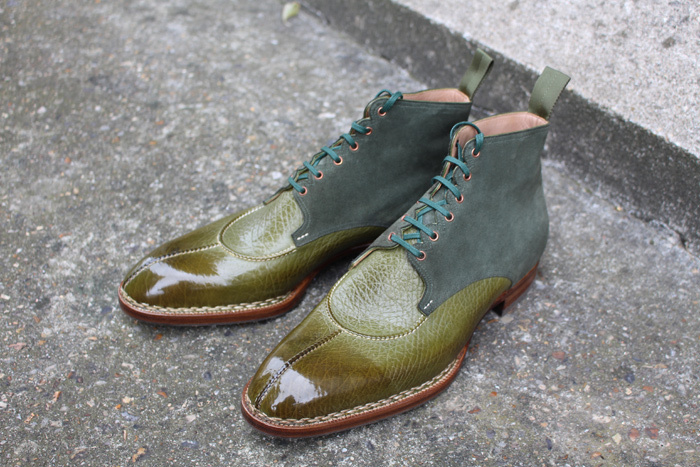 Exceptional not only for its unique style, but also by the work of craftsmen who realized by hand the stitchings on the apron and the split toe. Note that the unique pattern of the 671 accentuates the sharpness of the foot. A pipping in « dark brown » finishes off this original and refined MTO. Discreet Vibram sole plate & Norvegese hand stitched to ball. 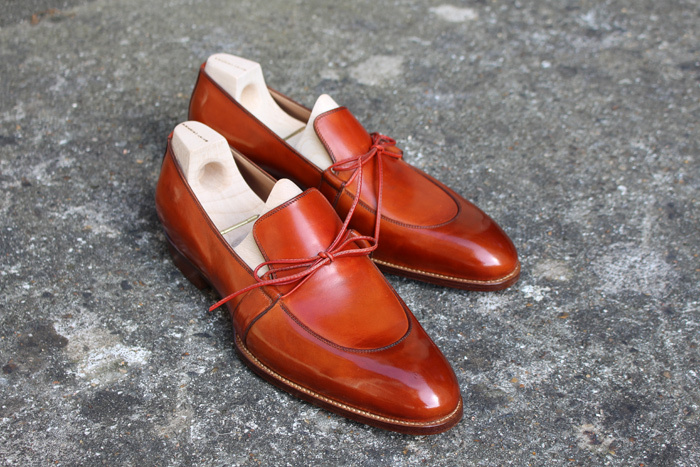 Perfect all the time, the plain Norwegian ghillie loafer 706 from St Crispins in Box calf patina Red Cognac. 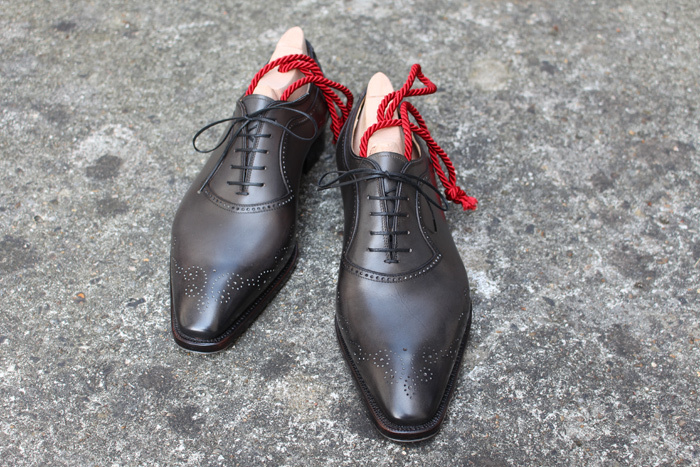 The quality and details of craftmanship on St Crispins footwear is always mind blowing. Have a close look at the apron (the apron is hand sewn onto the vamp from below), amazing work there. 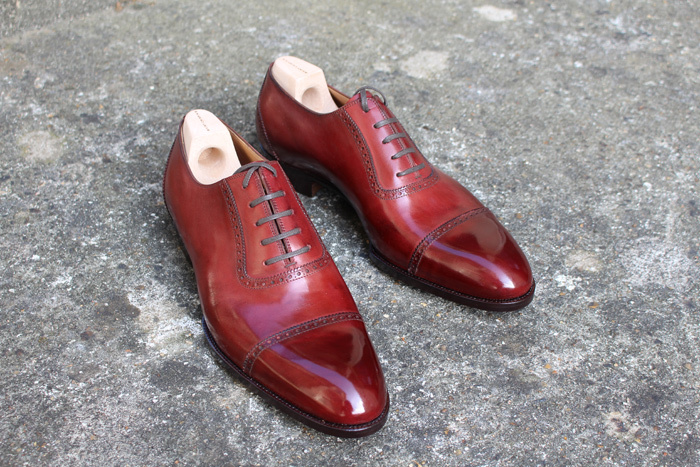 the top part and the « Mahogany french calf » for the rest of the shoe. 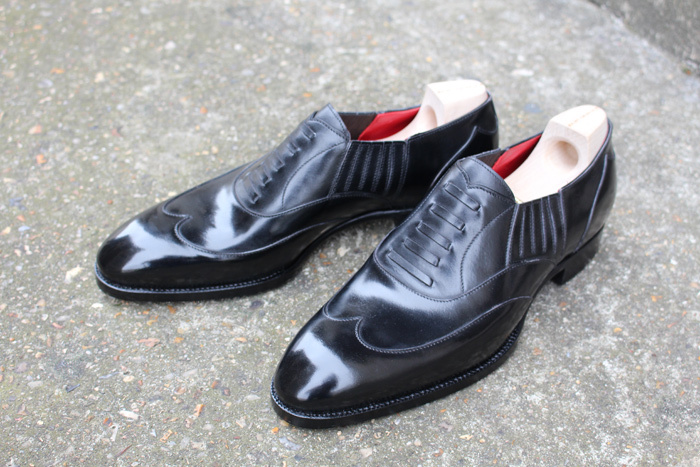 Lasted on the « Perfetta » with a distinctive U-shape cap-toe. Versatile in your wardrobe, the York is an elegant shoe to wear in casual or semi-dress occasions. I would like to thank my client Sir MBL for the trust he has placed in me.